The Boise Hawks are a minor league baseball team in the western United States, located in Boise, Idaho. The team is currently a farm team for the Colorado Rockies and play in the Class A-Short Season Northwest League. Prior to moving to Boise, the team was the Tri-Cities Triplets, who played in Richland, Washington, for four seasons after moving over from Walla Walla in 1983. An affiliate of the Texas Rangers for the first two seasons in Richland, they operated as an independent in 1985 and 1986. The Triplets were sold in the fall of 1986 to Diamond Sports and moved to Idaho for the 1987 season. Diamond Sports was headed by the Triplets' general manager Mal Fichman. Their debut game was on the road and drew over 7,100 at Spokane, aided by the appearance of Hank Aaron. Continuing as an independent for their first three seasons in Boise, they joined the California Angels organization in 1990; the Angels were previously affiliated with the Bend Bucks for two seasons. The Hawks made the playoffs that first season under the Angels and then won the league title four times in the next five years. After eleven seasons with the Angels, the Hawks moved their affiliation in 2001 to the Chicago Cubs, who were with the Eugene Emeralds for the two previous seasons. Under the Cubs, the Hawks won two league titles and were runners-up three times. After fourteen years with Chicago, the Hawks switched in 2015 to the Rockies, who were previously affiliated with the Tri-City Dust Devils in Pasco for fourteen seasons. The Hawks play their home games at Memorial Stadium in northwest Boise, north of the Western Idaho Fairgrounds. The facility on the banks of the Boise River has a seating capacity of 3,500; it opened in 1989 for the Hawks' third season, its last without an affiliation. The stadium was privately built by an investor group led by Bill Pereira and son Cord Pereira. For their first two seasons, the Hawks played their home games at Bill Wigle Field on the campus of Borah High School. Starting in 1939, Boise was a longtime member of the Pioneer League then in Class C. The teams were originally known as the Pilots, and later as the Yankees (1952–53), back to Pilots (1954), and Braves (1955–63). They played at Airway Park, later known as Braves Field, about a half mile (0.8 km) east of Bronco Stadium, in Municipal Park in east Boise, now the site of the headquarters of the state's fish & game department. (photo – 1950s) The present-day campus of Boise State University was the site of the original Boise airport until 1940. Noted broadcaster Bob Uecker played catcher for the league champion Boise Braves in 1956 and 1958. The Pioneer League was moved to Class A for one season in 1963, and it was the last for the Boise Braves; the city went 11 summers without minor league baseball. The Pioneer League, now a rookie league, shifted west in the Treasure Valley to Caldwell with the Cubs, who played at Simplot Stadium from 1964 through 1971. Boise's original team in the Northwest League was the Boise A's, who debuted in 1975. The new franchise was awarded in 1974 to begin play in 1975, but in the meantime, two NWL teams folded after the 1974 season, New Westminster in British Columbia, and Lewiston in north central Idaho. The Lewiston Broncs were an affiliate of the Oakland A's, who shifted their players to Boise for 1975. The Boise A's played their home games at Borah Field and the manager was Tom Trebelhorn, a Bronc player the previous year. The home opener on June 18 drew 1,814 fans for the first pro game in Boise since 1963. Fresh from high school, future hall of famer Rickey Henderson played in 46 games for Boise in 1976 and hit .336 as a 17-year-old. Even with the exciting Henderson, attendance had fallen dramatically from an average of 800 per home game in 1975 to just 250 in 1976. After just two seasons, the team left for Medicine Hat in eastern Alberta for the 1977 season, where they joined the Pioneer League, a rookie league since 1964, as the Medicine Hat A's. The A's went without an affiliate in the NWL in 1977; in 1978 it was the Bend Timber Hawks, who moved south in 1979 and became the Medford A's. After a summer without pro ball, the independent Boise Buckskins debuted in the Northwest League in 1978 at Borah Field, owned by the former female general manager of the Portland Mavericks, 27-year-old Lanny Moss. Despite starting with an 11-3 win over Salem in their debut, the team never gained a foothold and quickly folded after a 23–49 (.319) season, poor financial performance, low attendance, inability to meet payroll, and the failure to garner an affiliation with a major league club. The Philadelphia Phillies chose to put their NWL team in Bend in 1979, rather than Boise or Salem. Boise went without minor league baseball for eight summers until the Hawks arrived in 1987. The manager was Gerry Craft, who made headlines early regarding divine guidance. A notable Buckskin was Danny Thomas (1951–1980), the sixth overall pick in the 1972 draft who had played over 50 games with the Milwaukee Brewers in late 1976 and early 1977. Because of his religious beliefs, he played only six days per week. The Boise Hawks are owned by Agon Sports & Entertainment LLC, and the company president is Jeff Eisemann. 1990: Lost to Spokane 2-1 in finals. 1991: Defeated Yakima 2-0 to win championship. 1993: Defeated Bellingham 2-0 to win championship. 1994: Defeated Yakima 2-1 to win championship. 1995: Defeated Bellingham 2-1 to win championship. 1997: Lost to Portland 3-2 in finals. 1998: Lost to Salem-Keizer 3-0 in finals. 2001: Lost to Salem-Keizer 3-0 in finals. 2002: Defeated Everett 3-0 to win championship. 2004: Defeated Vancouver 3-0 in finals. 2006: Lost to Salem-Keizer 3-1 in finals. 2011: Lost to Tri-City 2-0 in semifinals. 2012: Defeated Yakima 2-1 in semifinals; lost to Vancouver 2-1 in finals. 2013: Defeated Salem-Keizer 2-0 in semifinals; lost to Vancouver 2-1 in finals. 2014: Lost to Hillsboro 2-0 in semifinals. ↑ "Tri-City Americans can learn lesson or two from Fichman". Tri-City Herald. July 24, 1988. p. D1. ↑ Stalwick, Howie (June 15, 1987). "Tribe geared for fan assault; Aaron due". Spokane Chronicle. Washington. p. C1. 1 2 Stalwick, Howie (June 17, 1987). "Valentin plays heart out in Indians debut". Spokane Chronicle. Washington. p. D1. ↑ "Trips sale final to Diamond Sports". Tri-City Herald. November 10, 1986. p. C3. ↑ "It's official: Triplets now Boise Hawks". Tri-City Herald. November 21, 1986. p. D2. 1 2 "Boise's manager hoping to tear down baseball's racial barrier". Idahonian. Moscow. Associated Press. July 11, 1987. p. 20. ↑ Stalwick, Howie (June 2, 1987). "Aaron will help Tribe open year". Spokesman-Review. Spokane, Washington. p. B4. ↑ Pritchett, John (October 5, 1989). "Bucks will be back in Bend next year, likely as a co-op". The Bulletin. Bend, Oregon. p. D1. ↑ "Ems put into new division". Eugene Register-Guard. Oregon. October 6, 2000. p. 4B. ↑ Clark, Bob (June 22, 2001). "Cubs keep a presence in league". Eugene Register-Guard. Oregon. p. 5B. ↑ Moore, Timothy (June 18, 2015). "Boise Hawks set to kick off first season as Colorado Rockies affiliate". Purple Row. Retrieved October 29, 2015. 1 2 "Miscellany". Spokesman-Review. Spokane, Washington. (staff and wire reports). October 28, 1988. p. D2. ↑ "Boise releases Eddie Fernandes". Spokane Daily Chronicle. Washington. Associated Press. October 26, 1954. p. 17. ↑ Lassanske, Bob (August 4, 1956). "Uecker stars as catcher with Boise". Milwaukee Sentinel. p. 6, part 2. ↑ Barrows, Bob (January 10, 1975). "Directors' vote kills Bronc baseball". Lewiston Morning Tribune. 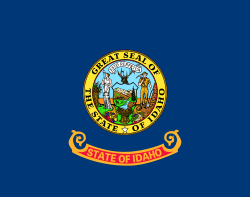 Idaho. p. B1. ↑ Barrows, Bob (January 11, 1975). "Broncs' demise no sudden thing". Lewiston Morning Tribune. Idaho. p. B1. ↑ "Pro ball returns to Boise after absence of 11 years". Lewiston Morning Tribune. Idaho. Associated Press. June 18, 1975. p. B1. ↑ "Boise drops opener before 1,814 fans". Lewiston Morning Tribune. Idaho. Associated Press. June 19, 1975. p. B1. ↑ "1976 Boise A's – team statistics". Baseball Reference. Retrieved October 29, 2011. 1 2 "Boise board tables 'Buckskins'". Lewiston Morning Tribune. Idaho. Associated Press. September 14, 1977. p. B3. ↑ "Teams added for Pioneer". Spokane Daily Chronicle. Washington. Associated Press. October 14, 1976. p. 34. ↑ Coulter, Mel (June 14, 1978). "Hawks must play waiting game as debut approaches". The Bulletin. Bend, Oregon. p. 12. ↑ Welch, Bob (July 4, 1979). "Seeing too much red at Genna". The Bulletin. Bend, Oregon. p. 12. ↑ Coulter, Mel (June 29, 1978). "A first for pro ball". The Bulletin. Bend, Oregon. p. 14. ↑ "Veteran, rookie supply opening-night punch". Ellensburg Daily Record. Washington. UPI. June 21, 1978. p. 9. ↑ "Northwest League – final standings". Eugene Register-Guard. Oregon. September 1, 1978. p. 1D. ↑ "Buckskins continue sans pay". Spokesman-Review. Spokane, Washington. Associated Press. August 22, 1978. p. 15. 1 2 "'Skins vote to play as Ems regain first". Eugene Register-Guard. Oregon. August 22, 1978. p. 3C. ↑ "Boise baseball team pulls out". Lewiston Morning Tribune. Idaho. Associated Press. February 10, 1979. p. B2. ↑ Withers, Bud (June 28, 1978). "Boise has to bear with Him after another loss to Eugene". Eugene Register-Guard. Oregon. p. 1B. ↑ "Advice from God led to release". Eugene Register-Guard. Oregon. Associated Press. June 29, 1978. p. 1B. ↑ Stewart, Chuck (May 9, 1978). "A job for Danny?". Spokane Daily Chronicle. Washington. p. 23. ↑ "Ex-Indian suicide victim". Spokane Daily Chronicle. Washington. July 15, 1980. p. 17.